I have a soft spot for Galle as I visited it with my nephew first! We were staying at Unawatuna and hopped over to Galle in 2013. 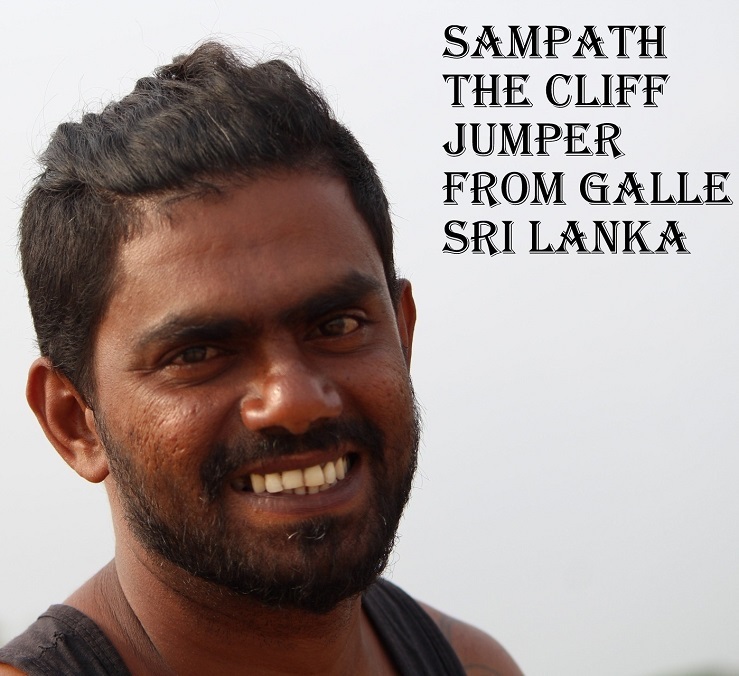 Then meeting Sampath the cliff jumper from Galle in 2018 has added another fond memory to it! So here I am at Galle again, writing this post as I wait for my other group members to walk back to our agreed upon meeting place. As it takes some time for a group to gather, I decide to utilize the time by writing. I am learning to work on the go! When I visited before I didn’t notice Sampat. He says he has been diving since he was 10. Because I have jumped from a few cliffs (two to be precise ) my curiosity is piqued. As I walk around I see no safe landing place! I feel even curiouser! There is a poster on the wall and the man sitting next to it looks like the man in the pictures! I walk up to him and ask if he is the man? He beams and says yes. When I check the height of the wall, he says it is 12 meters. I tell him I have jumped from 10 but it was in the deep sea. I see no place to land here. He laughs again and says he can land! Then I ask- why why why? He laughs again and says it is his livelihood. If you want him to watch he charges 20 dollars. He added he is useful when people fall in or expensive gadgets take a tumble! There have already been 16 cases of people falling in. I asked if he has jumped today? He said yes as a high ranking military man visited and he wanted to see! I walk away after clicking a picture of him! Then curiosity gets better of me, and I walk back to him. I ask if I can pay him in Indian Rupees? He agrees. I part with 1500 Indian Rupees and wait. He requests people at the edge to clear a way for him. I am ready with my camera. It gets all over in a flash. He runs, flies and dives head first! I wish I could see it only with my eyes but I see it only through that square box of my viewfinder. 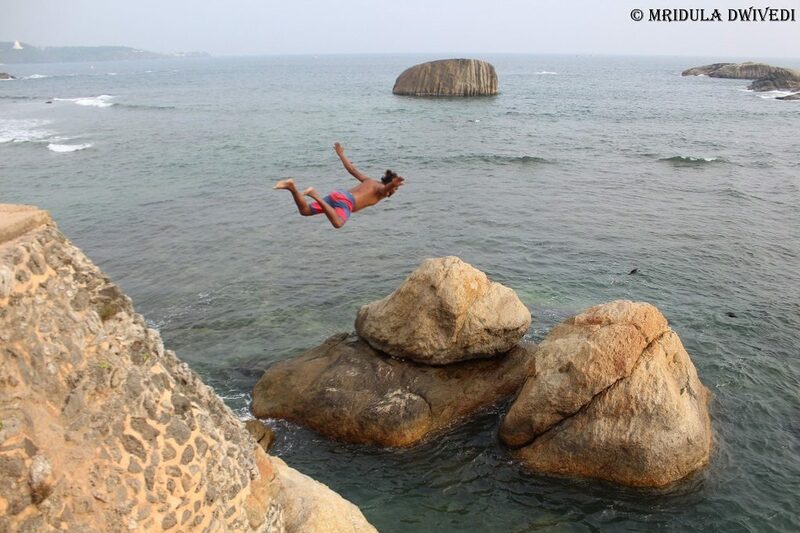 He surfaces and jumps from a shallower rock! Then he climbs the rock and comes back to the top. I give him a few moments and then the questions start. That interaction is on the video above. I hug him and tell him to stay safe. As I walk off I wonder if I did the right thing? By paying him was I encouraging him to lead a dangerous life? I don’t know and I don’t judge him for the life he has chosen. I hope you won’t judge me for the choice I made. PS. I was invited on board the inaugural Chennai Colombo Flight by Indigo 6E and visited Galle as part of the same trip! It was a thrill to watch him jump! 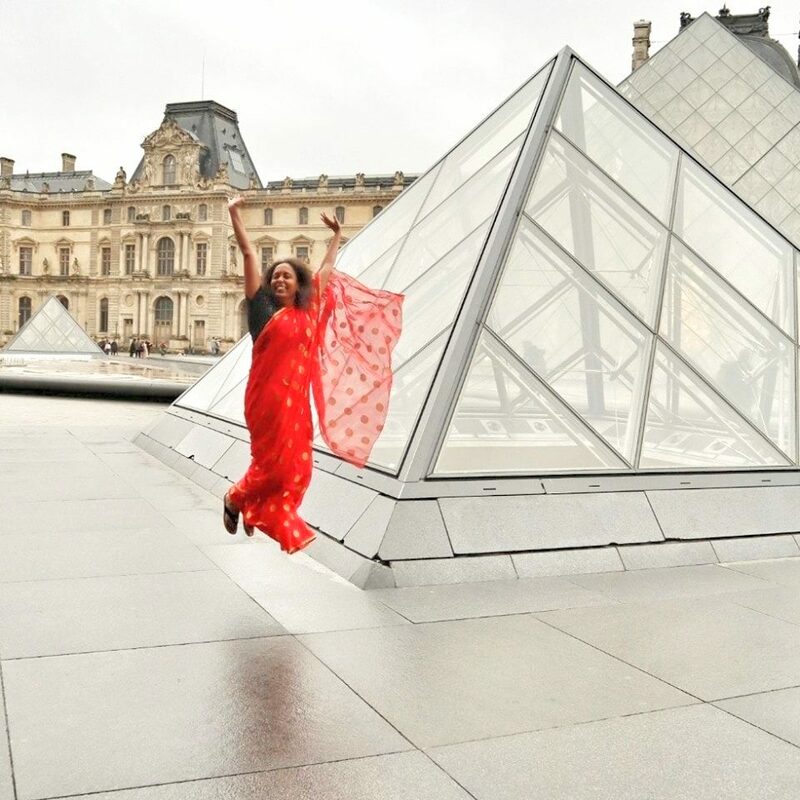 Thank you Pushpendra for stopping by! Yes he climbed up with ease and grace! That was indeed incredible! And yes he climbs the cliffs so effortlessly too! Thank you Mridula for sharing this! Thank you Deepak sir for stopping by! Wow Sampath! I had once seen a short film or something like that about 2 Indian kids (brothers if I remember right) who jump from cliffs for livelihood. Felt moved! Thank you Deepa, I was moved too! True but the water is so shallow where he lands! good to know about him, I think you did good giving money to him not for supporting dangerous life that he is living but for running his house may be as income source. Thank you Mayuri! On the second trip I discovered there are three of them who take turns to do the jump but I had no time to go meet them this time! Jumping, climbing, jumping and climbing… all in just 1.30 minutes!!! I am speechless!!! Can’t he do this with a helmet and a safety jacket?! I think, you did it right telling him to stay safe. 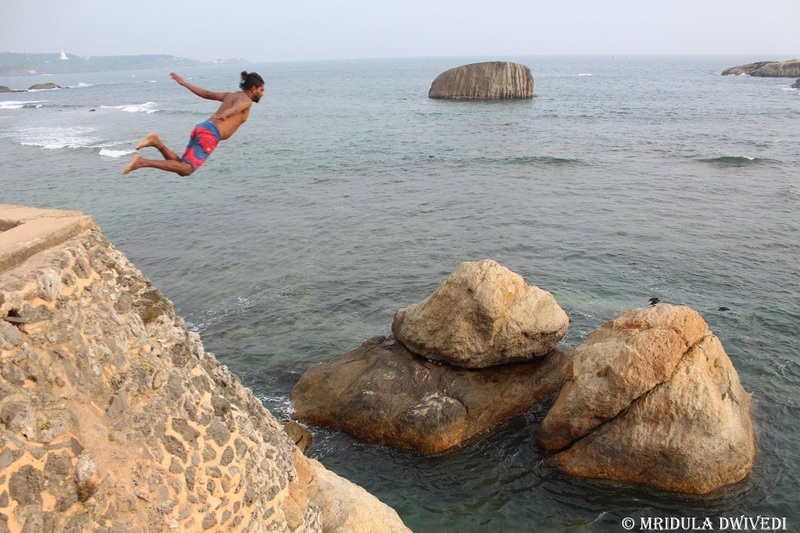 Yes Sindhu it was really risky as the water is shallow! Thank you so much for your kind words!